Hurricane Harvey came in like a thief in the night he not only stole our city he stole our peace of mind. And if you are anything like me that’s the most important thing I currently possess and work daily on to maintain. Some of us waited for the storm just to see the outcome of it all, and some of us have been through so many storms in life Hurricane Harvey would be nothing unusual. Some would say the catastrophic effects of Harvey were related to biblical events, some say jokingly “Harvey was just like a man that Nevers askes for direction and is all over the place and leaving a mess of things everywhere” I’d say both to be true along with this which will sum it all up. In order to get to something new all things must be renewed and the only way to do that would be to “wash all that is unclean” Right? Well that’s what Harvey did he came in washed away somethings that had they stuck around we might not have ever discovered what the real meaning of life is. In a blink of an eye or in this case 48hours Life can change and NEVER BE THE SAME AGAIN. It is within all of this we must find a place to re-evaluate our existence and then take life 1 day at a time to rebuild. Some people had little to nothing before this storm and now they have zero. And as an advent community worker I see the need I saw before Harvey and I see it more than ever now that the storm has passed. I shed tears for the first 3 days after the storm past wondering how to help the women and families reaching out to me and having to create a waiting list because of limited funds and resources. I was extremely concerned about the Mental Health that people were having to deal with. There were women going into labor early because of the trauma they experienced trying to get to safety. Mothers lost children the emotional toll this took on the mental peace of mind is indescribable. Because of Harvey there is even more work to be done to rebuild a healthy mental state of mind of the people here. 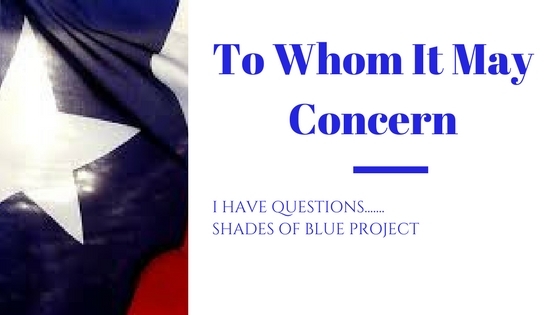 It’s been my goal and my responsibility when I created my organization The Shades of Blue Project and that was to watch over the women and children I serve. In order to rebuild the Great state of Texas we must have money that is given in an Inclusive way not an Exclusive Way. There are several and I do mean several small organizations that even before and now after the storm are out in the communities working, serving, helping and more and I have yet to see hundreds of thousands of dollars being sent to them or us. I have watched companies and individuals either collect or donate all of this money to the Hurricane Harvey Relief Fund and these questions are constantly on my mind WHO, WHAT WHEN & WHERE is this money going? I along with other organizations would be able to utilize these funds just as the bigger organizations would. Before this storm it was frustrating to not be able to do all that needs to be done But it is an even bigger slap in the face after a disaster the same issues still exist knowing that over 100 million dollars has been collected to help the people we serve yet we are not in the receiving line for the funds, but we are still being depended on to give to those in need. I’m simply saying at what point in time will we truly all be as 1? It doesn’t matter if you have 4 Board Members or 20 board members we all need money to operate whether big or small. So in closing I want to say I’m watching all of you Big Company Big Named Individuals collecting donations for those devastated by Hurricane Harvey because little ole me with the small organization sure hopes you give funds appropriately and also help the small organizations like myself and others in the mist of it all. We will rebuild 1 day at a time no matter what we are Houston Strong we are Texas Strong We are 1.